Temporary sign solutions to get your business moving. 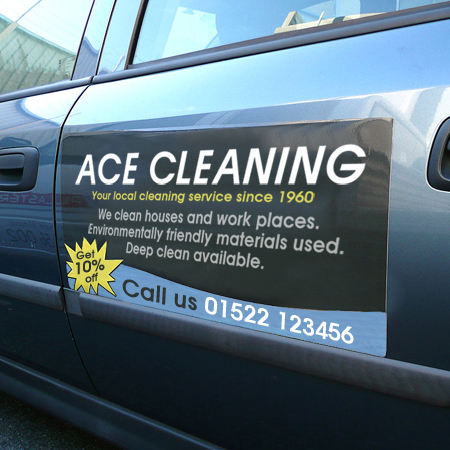 Magnetic signs are becoming a fashionable and increasingly popular alternative of vehicle advertising. This provides the flexibility to display or remove your advertising at will and can be supplied in many shapes and sizes. Driving Instruction, Mobile Hairdresser or Home Services, Day/Night time delivery, etc. These stick to any flat ferrous metallic surfaces and the face can be printed in high quality full colour for maximising promotional and advertising opportunities. Please be aware that you need to clean and maintain the material to keep it safely attached to the vehicle. Leaving the magnetic sign on for extended periods in a row may cause discolouration so it is important to regularly remove your sign.